Treat your loved one with our high end Spa Gift Box that instills comfort, warmth and serenity. Spark memories and create fun festive feelings of relaxation and calm. 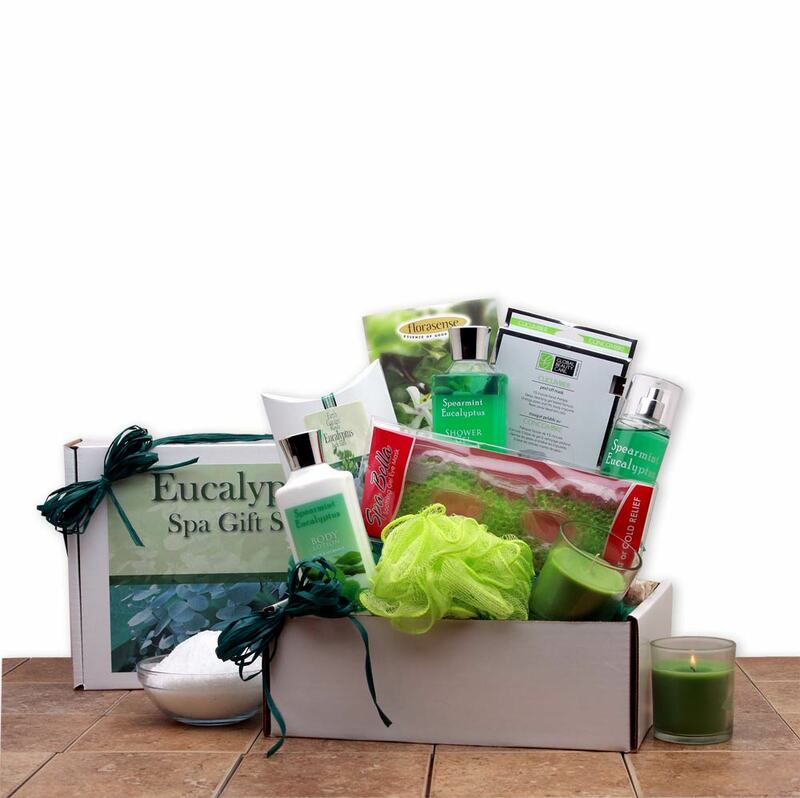 Our Eucalyptus Spa box is the perfect gift for Birthday, Mother’s Day, Anniversary, Thank You, or for no reason at all. Your gift will leave a lasting impression as they continue to use and enjoy this hand crafted spa gift box that soothes both their body and their mind with the calming scent of Eucalyptus with a hint of spearmint. We use all full size 8 oz bath products and each and every gift is hand packed and created by talented gift baskets artisans. Our gifts are not mass produced and put together by machines nor are they run through shrink wrap machines. All of our gifts are hand crafted, hand wrapped and finished with hand tied bow for a truly one of a kind experience. Includes: 8 oz. Moisturizing eucalyptus & spearmint Body Lotion, 8 oz. Moisturizing eucalyptus & spearmint Bath Gel, 8 oz. Moisturizing eucalyptus & spearmint Body Spray, poured glass candle, aromatherapy drawer sachet, facial mask, bath loofah ball, foaming bath salts. Actual gift box measures 8" wide by 8" long and is 3" tall. Closed and sealed and wrapped with a hand tied bow. Completed gift weighs 4 pounds.